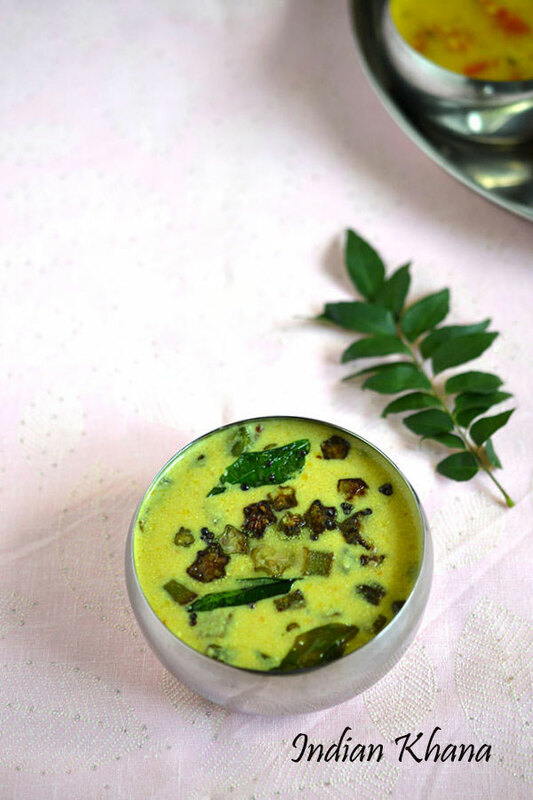 If you are new to mor kulambu then there are high chances you have curdled curry as end product but if you pay little attention and do not let the gravy boil after adding curd then you will get perfect mor kuzhambu, it's really easy, quick and delicious. 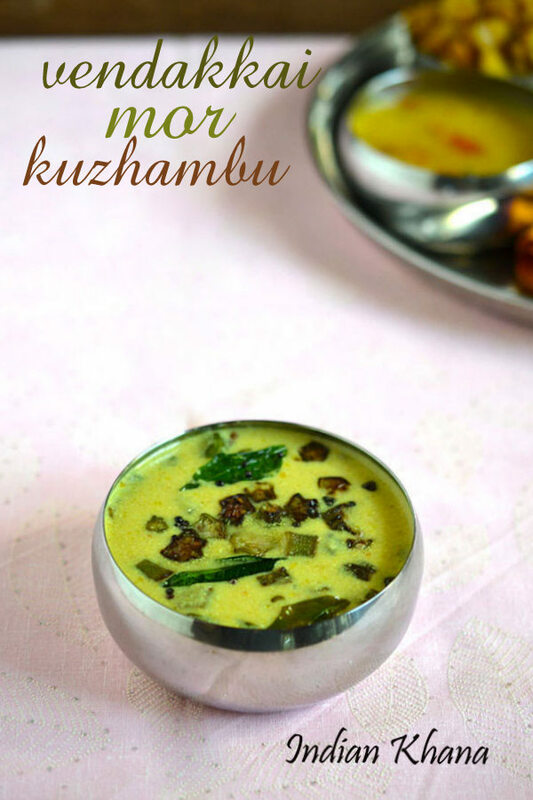 I still remember almost a decade back I made mor kuzhambu without referring any recipe and endup having curdled kulambu though the taste was very nice. Then of course I learnt the recipe and now there's never a problem with curd curdleing. So read and follow the steps to have perfect moor kuzhambu too, though I personally like to add okra/vendakkai compare to any other vegetable but you can add any vegetable of choice. If using chow-chow, bottle gourd etc then boil the vegetable first before adding to kuzhambu. 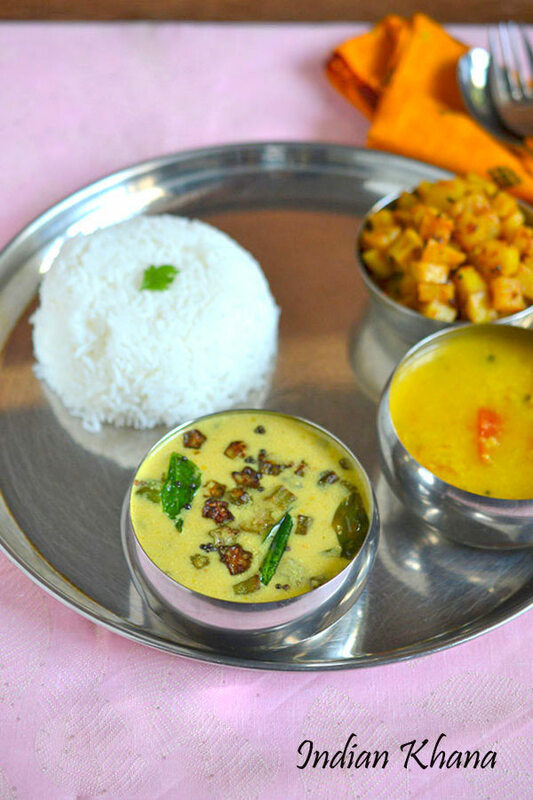 Mor kuzhambu and kadhi taste is very similar if followed before recipe, as some people add tuvar/ahar dal instead of chana dal. And like kadhi more kuzhambu also taste better later or next day. Serve with steamed rice and it's enough on it's own but a simple potato fry taste yum along too and I had to make tomato dal for DH as he won't eat yogurt base curry whether it's kadhi or mor kuzhambu! 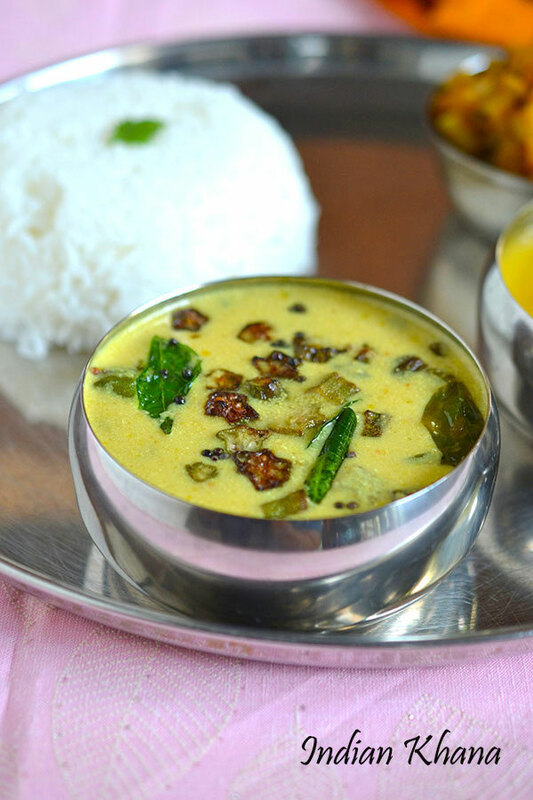 Mor Kuzhambu with fried okra (vendakkai) is mildly spiced South Indian yogurt base curry. Soak coriander seeds, red chilies, cumin seeds, channa dal for 15 minutes. Meanwhile wash, pat dry and chop okra in small pieces. Grind soaked ingredients with coconut, ginger, green chilies into fine paste, use 1-2 tbsp water if required. Heat 1 tsp oil in pan and fry okra/bhindi until soft and light brown, keep aside. In the same pan add dal-coconut paste we made with 2 cups water and mix well, cook in medium flame until boil and simmer for 5 mins or until there's no more raw smell. Whisk curd well with salt, turmeric powder, add this to cooking kuzhambu mixture with keep flame to slow and cook for a min. (don't let kuzhambu boil to avoid curd from curdling). Now add fried okra/bhindi and cook again in slow flame for 2 minutes. In another small pan or tadka pan heat 1 tsp oil add hing, mustard seeds, curry leaves and allow mustard to splutter. Pour prepared tempering over kuzhambu, cover pan and let it sit for minimum of 10 mins before serving. Serve warm or cold with steamed rice, simple potato fry on side for a delicious comfort meal. Use slightly sour yogurt but not very sour. Add yogurt only after keeping flame in sim as much sim as possible and don't let it boil just simmer. This mor khuzambu taste better in the night (if made in afternoon) or next day too. You can add any other vegetable of your choice. 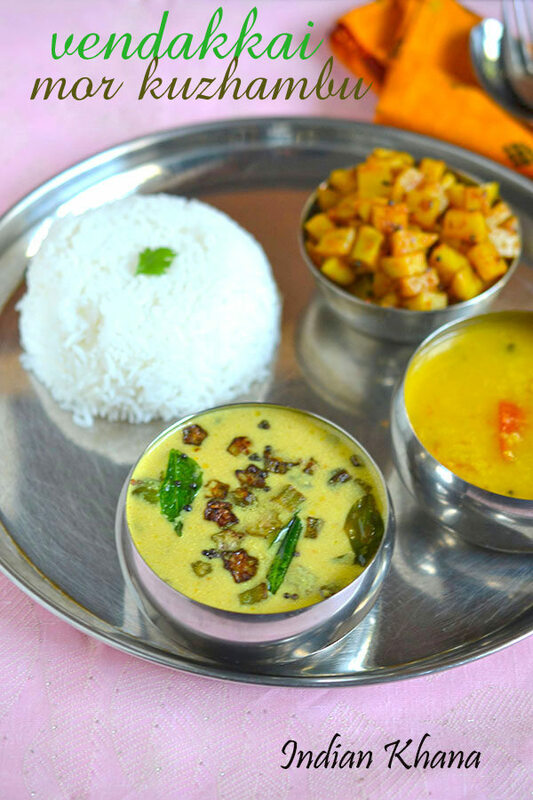 Comfort weekend meal with potato fry, tomato dal, mor kuzhambu and neer mor (not in picture).